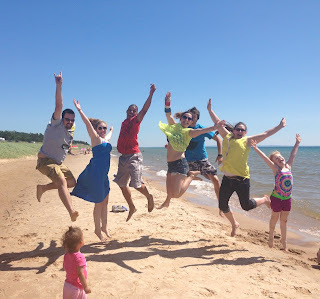 Michiganders know about the natural beauty of the Sleeping Bear Dunes, the beaches of Grand Haven and the throwback charm of Mackinac Island, but there are several lesser-known vacation towns and destinations throughout Michigan that make for incredible getaways. From enjoying quaint beachfront towns to sprawling nature preserves, many people have favorite spots they like to visit year after year. But there’s nothing like discovering new areas for an exciting vacation adventure. Community Financial Novi Branch Manager Nancy Pieske is a big fan of camping in Mackinac City, but her family has been known to frequent other less-known spots as well. The Lake Michigan towns of Petoskey and Ludington are among her favorites because of their scenic views and access to Lake Michigan. Port Huron and Port Austin also rank high on her list for their Lake Huron splendor. She's also taken the family to St. Ignace, which is just across from the Mackinac Bridge. Pieske's family enjoying time at the beach in St. Ignace. Each of these towns feature the type of laid-back, small town family atmosphere that makes them perfect for either a quick weekend getaway or an extended stay. Hillman Branch Assistant Manager James Timrick is also a fan of Petoskey, and the whole northwest Lower Peninsula area with its scenic Lake Michigan landscapes that make for a good drive. Timrick enjoys stopping in Charlevoix for watersports such as boat and wave runner rentals as well. He’s also is a fan of golf getaways in Gaylord, home to another Community Financial Branch. One of his favorite spots is The Natural, a course rife with wildlife and natural terrain. Among Lake Huron spots, Timrick enjoys the small northeastern Lower Peninsula town of Alpena, which features snorkeling and glass bottom boat tours of shipwrecks. “The water is so clear and you can look right through the bottom of the boat and see all of the wrecks in their natural state and the bottom of the lake,” he said. Other lesser-known but exciting spots in the Great Lakes State include Munising in the Upper Peninsula home to the Pictured Rocks National Lakeshore and several nearby waterfalls, Isle Royale National Park in the upper UP, and many more. What’s your favorite Michigan vacation destination? Let us know in the comments below or on our Facebook page.